We offer two styles of dog kennels that ensure maximum protection and security for any dog in Mooresville. 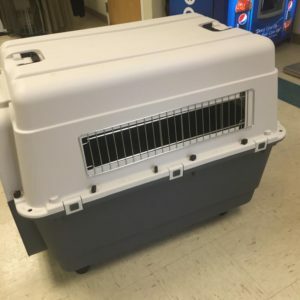 Kennel Crate – Our kennel crates are equivalent to the VARI-Kennel 500 series, including detachable wheels and three handles for easy access. These are great for dog breeders or rescue dogs that need a secure space. Aluminum Kennels – If you are looking for custom-made dog kennels that offer a lightweight option, our aluminum kennels are the perfect match. Easy to clean and available in singles or doubles, your dog will have the perfect den to call his own. Having the proper dog kennels can ensure the success of your dog training, give your pet a place to feel secure, and offer safety in a number of circumstances. Check out our online store for these options and our other great quality dog products at Dogs By Andy K-9 Services. Once you’ve picked out the perfect dog kennel, we’ll keep it for you until you can come by to pick it up. Dog kennels are an investment, but the benefits to you and your dog will be immediate. Contact us today with your questions, and we’ll be happy to assist you. Your puppy is born with natural instincts that include being part of a pack that would stay in a den. They feel safe in a covered environment that gives them visibility and security. At Dogs By Andy K-9 Services, we provide dog kennels for residents of Mooresville, Concord, Huntersville, Cornelius, Gastonia, and the Charlotte, North Carolina area, including Myers Park, Weddington, Ballantyne, and SouthPark.